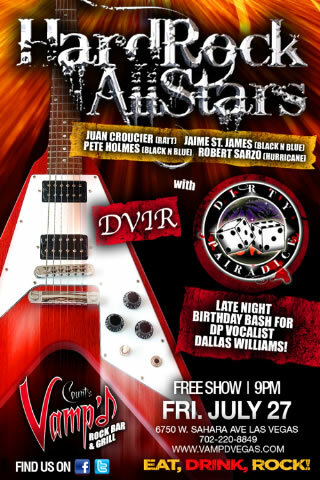 Update: 5-25-11 We're playing Vamp'd in Las Vegas on June 18th. Update: 4-12-11 We're playing the benefit; Rockers For Japan! April 16th at Harpers in Tarzana Ca. We go on at about 9pm. For more information click here. Update: 1-19-11 We're playing the Cat Club on Sunset Blvd., in Hollywood this Saturday Jan 22nd at 11:00pm! 5 bucks to get in with this flyer (Get Flyer Here). Or just mention your there to see The Hard Rock All-stars and get in for 5 bucks. 12-3-10 Harpers Bar and Grill - 5545 Reseda Blvd. Tarzana, CA 91356 (818) 342-9300 For more info., click here. 11-29-10 The Key Club - 9039 Sunset Blvd. West Hollywood CA 90069 (310) 274-5800 HardRock AllStars with Steel Panther and Clean Corruption! For more info. click here.